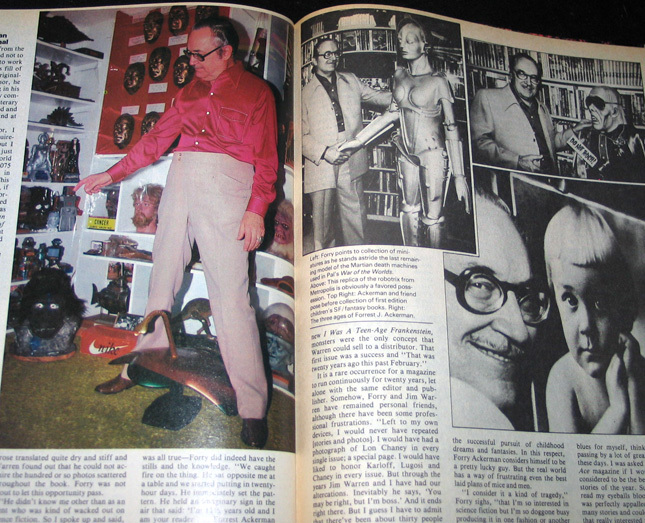 It was about Forrest J. Ackerman, of course: writer, literary agent, and editor of Famous Monsters of Filmland. 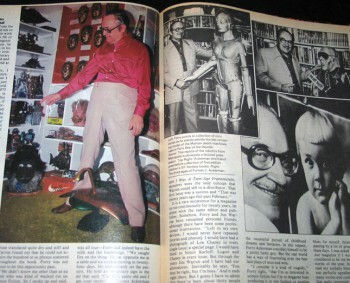 But Forry’s greatest claim to fame was his legendary science fiction collection, housed in the Ackermansion in Los Angeles. The article appeared in the 1978 issue of Starlog, and it had a pretty profound effect on me. After I read it, I knew what my life’s work would be: to build a science fiction collection that could stand with pride alongside Forrest J. Ackerman’s. These are the things that only a 14-year-old can dream. I got to meet Forry a few times, before he died thirty years later in 2008. It wasn’t hard — he could be found wandering the halls at every World Science Fiction convention. I remember running into him at Chicon 5 in 1991 with my friend Todd Ruthman. He showed us Dracula’s ring, which he wore on his finger, and talked to us enthusiastically for fifteen minutes. Forry loved to meet fans and he was eminently approachable. At Chicon 2000, Forry was invited to host a one-man panel on fandom and collecting, and he entertained the crowd for an hour. He said he was frequently asked if he’d read all the books in his library. A few years before his death, Forry was forced to break up his massive collection. Much of it was sold on eBay — over several years — and I bought a few lots myself. It felt odd to add some of Forry’s books to my own collection… but also kind of joyous, as if I was carrying on his legacy. Why am I bringing this up now? Because I made an odd purchase of memorabilia last week: a hand-made collection of pulp stories from Weird Tales, assembled by none other than Forrest J. Ackerman. It’s impossible to date the book, although the most recent story in it appears to be from 1932, which means it was probably made when Forry was around 16 years old. He was already highly active in early fandom by that point. 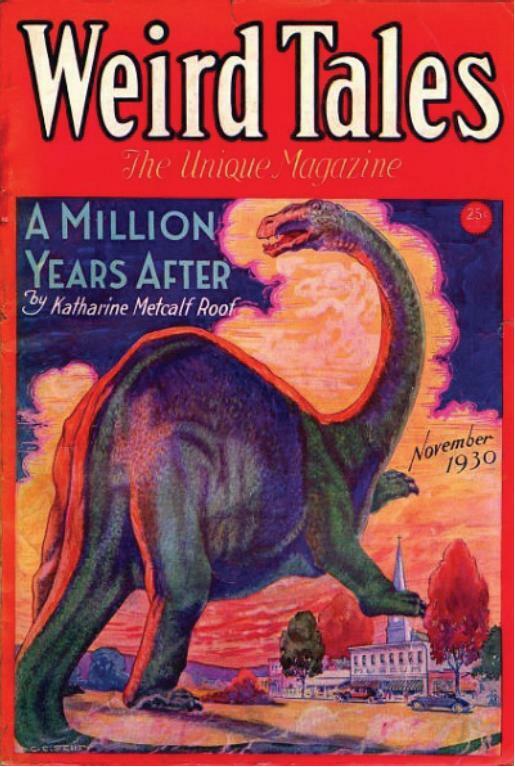 He’d purchased his first copy of Amazing Stories in 1926, created The Boys’ Scientifiction Club in 1930, and was contributing to science fiction fanzines by 1932. 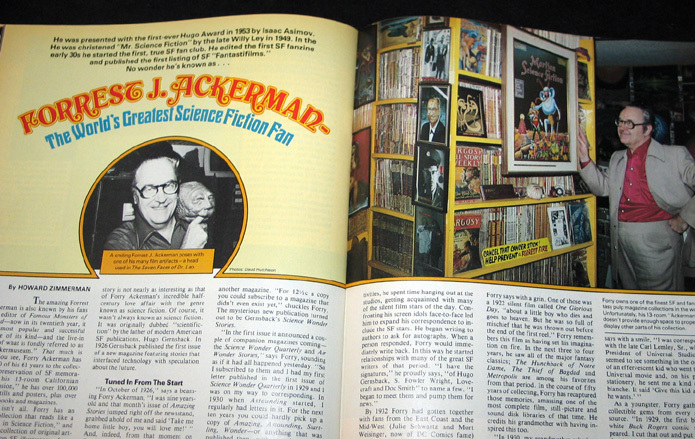 Aside from a stamp reading “Forrest J. Ackerman” on the last story, there’s no hard evidence that the book was actually assembled by Forry either, but I have no reason to doubt the seller. 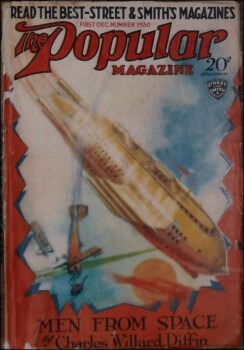 Hand-bound pulp stories, occasionally with front covers. 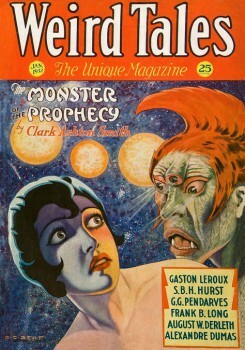 This volume was created using the original pages, removed from the pulp magazines (mostly Weird Tales). 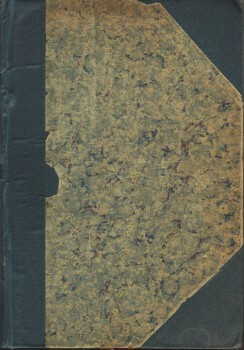 Green cloth over boards with somewhat damaged (see scan) marbleized paper as front/back cover decoration. Decorative front/back ep’s. 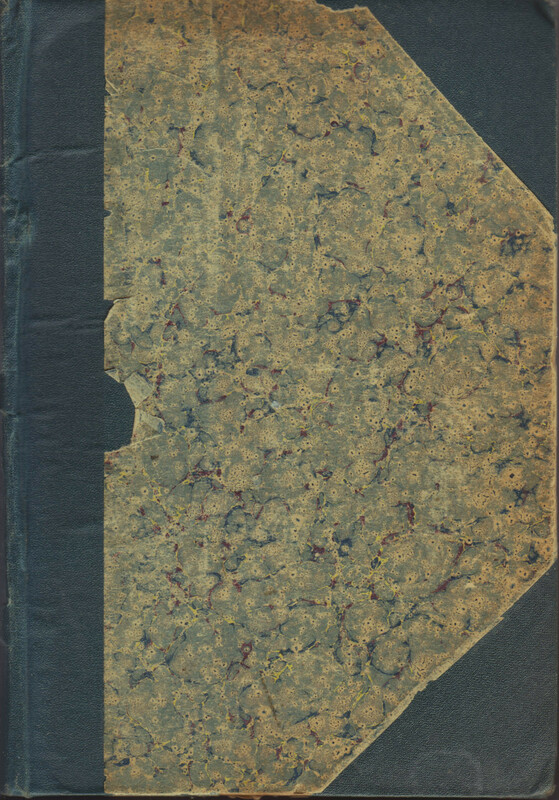 Interior pages are, of course, age-toned, and, while most pages are tender but supple, are sometimes difficult to browse because of the bulky binding. Includes hand-typed (by FJA) Table of Contents and, when necessary, a typed “cover page” identifying the story. This collection includes mostly stories from Weird Tales and a few from The Popular Magazine and Excitement. Authors include (among others) E. Hamilton, C. A. Smith, A. Jenkins, C. Jackobi, E. Keller and F. L. Scruggs. There are 36 stories in this hand-made “anthology” and the book is almost 1.5 inches thick. A one-of-a-kind labor of love from a legendary fan, especially for serious collectors of early Weird Tales stories. The book includes 36 stories and, while the pages aren’t sequentially numbered, I estimate it at a little under 300 pages. As the description implies, all the pages are cut from pulps and trimmed to fit the hardbound book. It’s a more-or-less professional job and, while the pages are very brittle, the book has held up very well over the intervening decades. I actually have a few of these hand-bound pulp collections, although this is the only one I have that bears Forry’s stamp. From what I’ve learned, it was a fairly routine practice in the early days of collecting. The first science fiction anthology, The Pocket Book of Science Fiction, was an innovation by Donald A. Wollheim, and it appeared in 1943. Before that, science fiction stories existed only in the pages of pulp magazines. And once they disappeared from news stands, there was no easy way to get copies again. Fans who wanted to preserve copies of their favorite stories would cut them from the pulps, and bind them between hard covers. It was frequently done with magazines by libraries, and the only copies of the first few issues of Amazing Stories I have in my collection were preserved that way — including the first issue from 1926. These were the first true science fiction anthologies. Hand made, and completely unique, they assembled short fiction from an eclectic mix of pulps, and my most recent acquisition is no exception. If it indeed collects favored selections from the pulps, as most of them do, then it gives some tantalizing insight into the SF the young Forry Ackerman most enjoyed when he first began reading it. It contains six stories by Edmond R. Hamilton, five by Clark Ashton Smith, three by Philip L. Scruggs, one by David H. Keller, and one each from Frank Belknap Long, Jr., Carl Jacobi, Hugh B. Cave, Wallace G. West, and Ralph Milne Farley, among many other names I don’t recognize. It also contains poems by H.P. Lovecraft (“Fungi from Yuggoth, Part 5”), Robert E. Howard (“The Last Day”), Kirke Mechem, Alice I. Anson, and Wilfred Branch Talman, although I imagine that’s an accident, as they appear to fill space at the bottoms of pages. All the stories are from Weird Tales, except for the last six, as noted. A small number of covers are bound in with the stories, including the cover for the November 1930 issue of Weird Tales, containing “A Million Years After,” by Katharine Metcalf Roof, the January 1932 Weird Tales (“The Monster of the Prophecy,” by Clark Ashton Smith), and the First of December 1930 issue of The Popular Magazine (“Men From Space,” by Charles Willard Diffin). All three of those covers are at right. Click for bigger versions. I have to admit, it’s a delight to have this artifact in my collection. 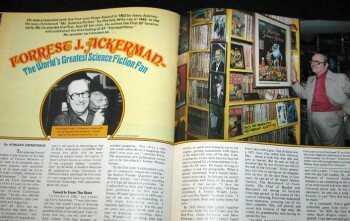 Not just for the marvelous stories, and the fascinating cross-section of early-30s pulp SF, but because it’s such a tangible connection to one of my heroes, Forrest J. Ackerman. Forry made a huge contribution to SF fandom — and science fiction in general — and I’m so pleased that fate has thought to share this fabulous collection of some of his favorite pulp stories with me. This unnamed one-of-a-kind anthology was presumably published and edited by Forrest J. Ackerman in the mid-1930s. It is around 300 pages. It has no price, but I bought my copy for $37.12 on eBay. Are all of the stories still covered by copyright? That would a mke a great collection to publish. I was an avid FM and Warren comics buyer back durig the first half of the 70s. Unless copyright was renewed, then the stories listed above are almost certainly in the public domain. And you’re right — I expect this would make a fabulous collection! Don’t expect me to be the one to do it, however. I already have a copy. At the 2003 DragonCon, Forry was doing a talk and kept asking for volunteers from the audience to act out various scenes from classic movies. I was lucky enough to be chosen for one such scene, and it is a memory I will always treasure. Forry was fandom personified. There will never be another like him. > I was lucky enough to be chosen for one such scene, and it is a memory I will always treasure. Ah, that sounds like a blast! I envy you. > Forry was fandom personified. There will never be another like him. Well said. I wish I’d said it in my article.